For their fifth full-length release, San Francisco's The Fresh & Onlys have expanded upon their Sixties-oriented neo-garage-rock approach — without leaving it behind. 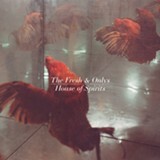 Traditional facets of the style are in place: House of Spirits' melodic songs are immediate and bittersweet, driven by jangly guitars and throbbing rhythms, while the band's palette has grown opulently. The dreamy yet pounding "Bells of Paonia" is awash in fuzz that's as feverishly "desert" in feel as early Meat Puppets (circa Up On the Sun), with the acid-hinted feedback of The Jesus and Mary Chain and Spacemen 3. The shimmering, enigmatic "Animal of One" pulses with melodramatic, Western twang (think Spaghetti Western film soundtracks) while Tim Cohen's Robert Smith-ish croon oozes windswept melancholia. "I'm Awake" conveys the autumnal sentiments of early Eighties post-punk icons The Teardrop Explodes and Echo & The Bunnymen (via dense production, a terse ringing guitar tone, and soulfully pensive singing) and will sound dandy when that fog bank rolls through the city. "April Fools Day" combines the driven, cyclic pulsation of Boy-era U2 with the wistful tunefulness of mid-Sixties Bay Area folk-rockers such as The Beau Brummels and The Mojo Men.